Diana Al-Hadid: Delirious Matter was originally commissioned by the Madison Square Park Conservancy. Katie Brule/Photo Editor. In the same elegant manner as autumn’s falling leaves, obscure feminine figures in cascading form have fallen onto the College’s landscape. Delirious Matter, an art installation created by artist Diana Al-Hadid – who was born in Aleppo, Syria and currently lives in Brooklyn – now can be found on campus after being displayed for four months across Madison Square Park’s central Oval Lawn, peripheral lawns and northern reflecting pool. It will now be on temporary display at the College for about a year. Lisa Dorin, deputy director for curatorial affairs at the Williams College Museum of Art (WCMA), explained that “WCMA [is] interested in partnering with students and colleagues across campus to expand the possibilities of public art in the future, and bringing Diana’s work this year was an initial step.” Al-Hadid’s work is inspired by literature, art history, architecture, Old Master paintings, frescoes, caves, Northern Renaissance art, Islamic miniatures, ancient time-telling devices and the modern sculpture of Italian Medardo Rosso. The hope is that the exhibit will spark conversations in our academic community. For this reason, the work is strategically located in highly trafficked locations on campus: The Grotto and Gradiva are located in Sawyer Quad, Citadel is located in Berkshire Quad and Synonym is located in front of Hopkins Hall. The Grotto and Gradiva are made of aluminum, steel, polymer gypsum, fiberglass and pigment. Gradiva was inspired by the 20th-century mythological female character named Gradiva from Wilhelm Jensen’s 1903 novella of the same name, which Al-Hadid described as a “weird little surrealist story.” The protagonist of the novella, Norbert Hanold, is an archaeologist who becomes obsessed with a woman depicted in a bas-relief sculpture that he sees in a Roman museum. After returning to Germany, Norbert manages to get a plaster-cast of the relief, which he hangs on a wall in his work-room and contemplates daily. Norbert obsessively chases his imaginary apparition on a journey to Rome, Naples and through the ruins of Pompeii, which ultimately leaves him wondering whether this woman that he believes he has seen is real or a delusion. Viewers of Gradiva can discern the figures vaguely emanating from the voids in Al-Hadid’s sculptural composition. The Grotto and Citadel are both inspired by a painting from 1475 titled Allegory of Chastity by Hans Memling. The piece depicts a female figure protruding from a mountaintop, the rocky formation suggesting an overgrown skirt around her waist. “My contemporary eyes saw it as a woman plugging a volcano,” Al-Hadid said. When asked what inspired her to pair The Grotto with Gradiva, Al-Hadid responded that she felt that “somehow they were magnetized to each other.” The Grotto and Gradiva are wall-like structures measuring 36 feet long by 14 feet high, and 15 feet long by 13 feet high, respectively. They seem to want to fit together like puzzle pieces, yet it would be geometrically impossible. In this way, the works seem to be in conversation with each other. The viewer’s perspective on the conversation depends, literally, on where they stand. The porous quality additionally enables the viewer to see through the sculpture, breaching the wall, in a sense. 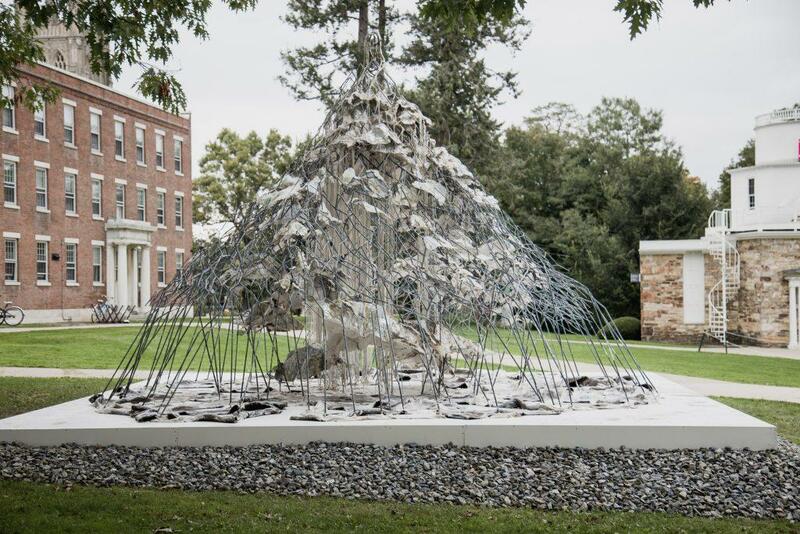 Al-Hadid was quite pleased to see the College’s beautiful mountainous landscape, which provides the perfect setting for the mountains depicted in her sculptures. Synonym is made of polymer modified gypsum, fiberglass, powder-coated aluminum and pigment. It appears to be a woman’s torso, headless, handless and legless, lavishly resting, yet devastatingly melting. In Al-Hadid’s own words, the sculpture is “very nebulous.” Opaque obscurity seems to be a defining element of her work. Those interested in learning more are invited to attend an opening reception and artist talk in Paresky at 5:30 p.m. today.